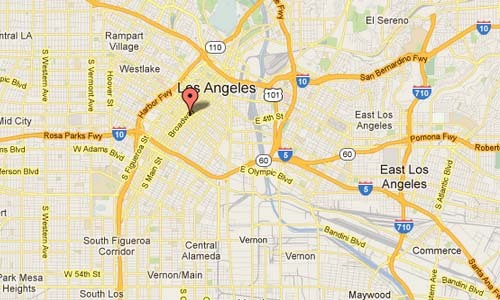 West 8th Street and Broadway are streets in the Historic Core and Broadway District in Los Angeles, USA. 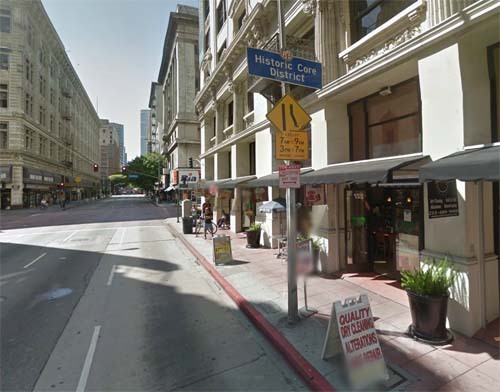 The Historic Core District is a neighborhood in Downtown Los Angeles between Hill and Main streets on the west and east, and 3rd and 9th streets on the north and south. Stretching for six blocks from Third to Ninth Streets along South Broadway in Downtown Los Angeles, the district includes 12 movie theaters built between 1910 and 1931. By 1931, the district had the highest concentration of cinemas in the world, with seating capacity for more than 15,000 patrons. Broadway was the hub of L.A.’s entertainment scene – a place where “screen goddesses and guys in fedoras rubbed elbows with Army nurses and aircraft pioneers.